Climate change is on the forefront of everyone’s minds, and at UT-Austin, ESI is pushing to promote the understanding of climate change through innovative research, outreach, and coursework. New predictions suggest global average temperatures will increase quickly. The thick blue lines show the predicted ‘likely’ range (66% confidence interval). 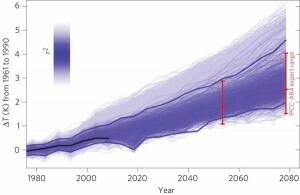 Red bars show the IPCC-AR4 ‘likely’ range at 2050 and 2080. (Rowlands et al., 2012, Nature Geoscience). A study of multi-model climate simulations published in Nature Geoscience suggests the possibility of stronger warming than originally anticipated. Global average temperature could be between 1.4°C and 3°C warmer in 2050 than it was just a couple of decades ago. That’s substantially higher than estimates produced by other analyses, suggesting that Earth’s climate could warm much more quickly than previously thought. 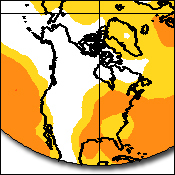 Global land temperature anomalies, 12-­month moving averages. Berkeley Earth data were randomly chosen from sites that were not used by the other groups (Muller et al. 2013; Fig. 1). A comprehensive analysis of the land surface temperature record was recently published in the Journal of Physical Research: Atmospheres, and it confirms that the modern world is warming. The Berkeley Earth Surface Temperature study, led by physicist Richard Muller at the University of California has taken a new look at historical surface temperature data. Previous studies used smaller data sets and corrected some temperature data based on probable measurement biases. 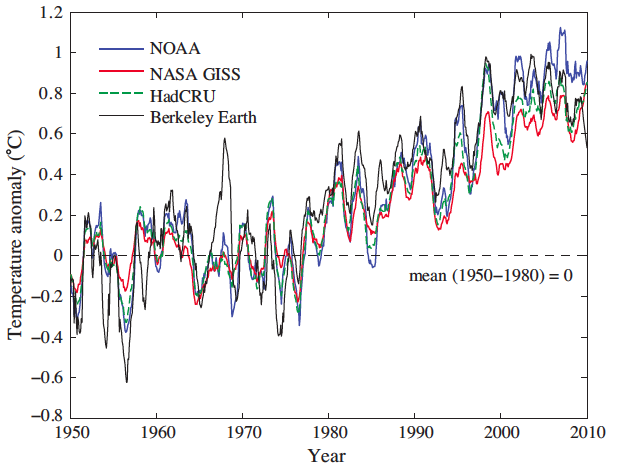 Some warming skeptics criticised this selection and adjustment of data. The new analysis starts from first principles, includes much more of the available data, and uses sophisticated statistical analyses to weed out bad measurements. The results confirm earlier studies’ estimates and indicate about 1°C (1.8°F) of warming since the mid-1950s. Dr. Yang uses the latest technologies to explore the interaction of land and atmosphere. ESI-affiliated researchers from the Jackson School of Geosciences, the Department of Geography and the Environment, and the Section of Integrative Biology are hard at work advancing the understanding of climate change and its impacts. For example, Dr. Zong-Liang Yang’s Center for Integrated Earth Systems Science (CIESS) is exploring the ways in which land shapes weather, climate, air quality, and water resources. For more about ESI faculty and their research, visit ESI’s affiliated faculty page. Since its inception, ESI has been leading the way in helping the public understand the importance and nature of global climate change. For example, Dr. Gerald North from the Department of Atmospheric Sciences at Texas A&M University presented a talk on the Lone Start Impacts of Global Warming during one of ESI’s Hot Science – Cool Talks events.